FOR LUXURIOUS LOOKING BEARD: Who likes growing a beard that looks weak and patchy? The premium Inglorious Fuzz beard oil and conditioner will make your beard look full and healthy. Your beard or moustache will instantly feel smooth, soft and tangle free. RELIEF FROM ITCHINESS: Forget skin irritation and itchy beard. This advanced oil will moisturize your skin and beard so deeply that the redness and the pain will be completely gone, even after the first use. This great oil for beard also helps eliminate flakes and dandruff, offering a healthy and handsome beard! SUPREME QUALITY- 100% NATURAL & ORGANIC: Unlike similar products that use a number of artificial ingredients that may harm your skin, the Inglorious Fuzz beard oil is made of the finest, all natural ingredients, ensuring that this is the best choice you can make. This formula is an infusion of pure Organic Cold Pressed Unrefined Golden Jojoba Oil and Argan Oil, widely praised for their nourishing and smoothing properties! NON GREASY- FRAGRANCE FREE FORMULA: This premium leave in beard conditioner has a lightweight and non-greasy synthesis while it is quickly absorbed in your skin ensuring that you won't be left with an oily looking beard. Note that this supreme grooming oil is also unscented so that it won't clash with you favorite cologne fragrances! No alcohol and no perfume added, just premium oils for the perfect manly beard! 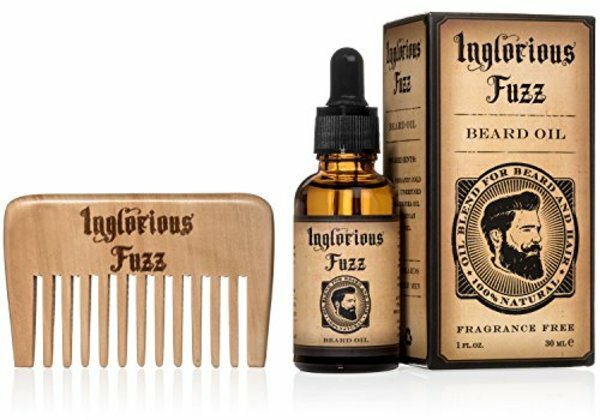 BEARD CONDITIONER KIT WITH DROPPER & COMB INCLUDED: Take the best care of your beard with the amazing Inglorious Fuzz beard set. Your beard softener comes with a dropper and a FREE BONUS COMB for easy and mess-free application. Just a few drops and you're good to go!